When Stoker, an old adversary of Jace's, contacts the NSA seeking help to break up a child trafficking ring, Jace isn't sure she should leap to the bait. If there's any chance that this could be true, Jace knows she has to try. Stopping child trafficking will see Jace cross the border where her badge doesn't hold as much power she's used to and if that were not enough, she's running out of ammunition for her gun, not that a gun will necessarily help her against the ancient God whose attention she seems to have unwittingly garnered. Just like everything else since Jace has entered Thropirelem, everything is SNAFU. The hook for this story is supposedly a child trafficking ring; however, D.D. Barant quickly changes the focus and the child trafficking actually becomes an almost insignificant plot point. As a reader, it felt a little bit like a bait and switch situation for me, particularly given that the plot we were given is so very convoluted that at times it was hard to follow. Also, if you're going to bring up something as serious as child trafficking, you really need to follow through. Thropirelem is an alternate universe in which vampires, Golems, and shifters exist in greater numbers than humans and have in fact take over the earth. This is not a book one should read if you have not already read the preceding four books. As it is, even with awareness of the backstory, Back from the Undead is hard to follow at times. D.D. Barant spends a lot of time on Shintoism in this book and introduces its concept of heaven and hell, as well as various deities. I will admit upfront that other than the kitsune, I know virtually nothing about Shintoism and therefore, I am no place to judge how Barant treated the belief system. Having a large focus of Back from the Undead be Shintoism, naturally led to the inclusion of characters of colour, including the return of Tanaka. Unfortunately, the characters of colour were all evil in some way with the exception of Tanaka. This is a problem given that this series hasn't been particularly inclusive in terms of race. We did learn about Tanaka's back story and it turns out that he's a samurai who now feels that he owes Jace a debt because he betrayed her. Unfortunately, paying back this debt means sacrificing himself for Jace. If you're keeping score, this means that all of the Asians are evil and the only one who isn't dies. This isn't great. As aforementioned, the number of characters of colour absolutely increased in this book however the only time racism is invoked is in reference to lems which are supernatural creatures who don't exist. Lem's are coded by the different kind of material used to give them a life force. A black enforcement Lem for instance is powered by dinosaur DNA. “Budget cutbacks,” the pire says. As aforementioned, Thropirelem is an alternate universe which for me took some of the joy out of a great majority of the story being set in Vancouver. It's not often that urban fantasy books are set in Canada, and so I always get excited but in this case, Vancouver is unrecognizable. In this world, the Canadian police are corrupt, Vancouver is a haven for drugs and gangs and so dangerous that the Americans have built a wall to keep Canadians out. I will say however that I loved Jace's interactions with the customs officials. Who hasn't wanted to pull the rug out from under a power hungry bureaucrat? Jace has experienced a lot in the first five books of this series. 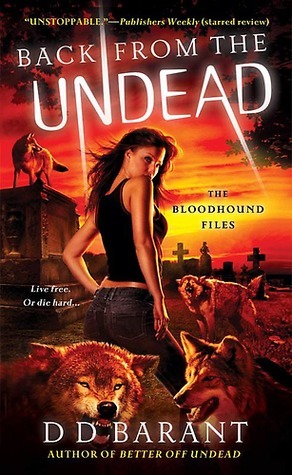 Back from the Undead is the penultimate book in this series and I really don't feel that Jace has grown at all, despite nearly dying several times, falling in love with a pire who has a human fetish, traveling between dimensions and fighting off Gods. She's still a mouthy shoot first ask questions later kind of girl. This can be fun when Barant is playing up on the differences between our earth and that of Thropirelem; however, it's a shtick that is getting a bit old. Back from the Undead barely even passes the bechdel test and that's only because Jace has a few phone conversations with Gretchen. It's worth noting that Back from the Undead has no GLBT characters. With only one book left to read in this story, I really want to see Jace show some growth from all of the things that she's experienced. I very much enjoyed watching her outsmart the antagonist in this book rather than reaching for her gun. It helped to see Jace as more than a weapon. I know that a lot of people are invested in Jace's relationship with Cassius but I don't want to see that develop. I really just want to see Jace end up at home after all that she's gone through. I'm not sure how this story will end and I've given up hope for real inclusion at this point, but I don't think it's too much to ask to see some real and sustained growth of the protagonist.